Click here for more information. The deadline to apply is April 23rd, 2019. 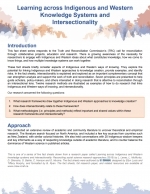 Release of the fact sheet series Learning Across Knowledge Systems and Intersectionality! Click here to read the 5 fact sheets from this series. The deadline for submissions is January 28th, 2019. Click here to learn more. 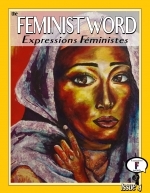 Women’s and Gender Studies et Recherches Féministes invites submissions for the WGSRF Outstanding Scholarship Prize. This yearly prize acknowledges the important contributions Women's and Gender Studies scholars have made to the field in the form of a monograph or an edited collection (significant documentary films are also eligible for the prize). 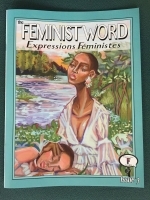 The book must make a significant scholarly contribution to and expand knowledge/theorizing in the discipline of Women's and Gender Studies. It also must have been published in English or French between January 2017 and December 2017. The deadline is December 1st, 2018. Please click here for more details. Click here to read the latest report from the CPS project! Access to formal workplace dispute resolution processes is important for workers to be able to challenge and overturn employer decisions and practices they perceive to be inconsistent with workplace rules, discriminatory or dangerous. We've found that diverse groups of women have different levels of access and/or comfort using these procedures. Check out the newest report from the Action on Systemic Barriers project! Learn more about improving gender and diversity equity and inclusion within local governments! Read the report "Pathways to a Women-friendly Surrey: Outcome Report June 2018" by clicking here. The 4th Edition of the F-Word is now available! 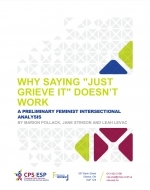 This policy briefing note authored by Senator Kim Pate explains what causes the majority of incarcerated women to commit criminalized acts in the first place and makes a case for changing the way racialized women are treated within our justice system, which often fails to protect them. CRIAW is looking for a Project Coordinator for Building Capacity for Intersectional Advocacy. Please follow the link for more information. Studies. Learn more by clicking here! Winner of the 2018 Barbara Roberts Fund! 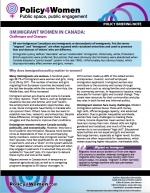 Policy4Women's latest briefing note examines challenges facing (im)migrant women in Canada and how better analysis and policy could support these women. In honour of International Women’s Day, Policy4Women has released “Amplifying Women’s Voices”, which calls on Canadian governments to work together to once again support and make space for diverse women’s perspectives in policy, programming, and decision-making. Now accepting applications for the Barbara Roberts Memorial Fund! 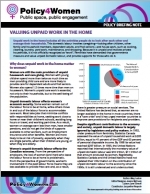 NEW Policy4Women briefing note: "Valuing Unpaid Work in the Home"